A NC Great-grandmother has $10 million more reasons to have very happy and prosperous new year, after her 'Extreme Millions' scratch-off ticket win on Christmas Eve. It's was a merry Christmas and now a very happy new year for a great-grandmother in North Carolina. 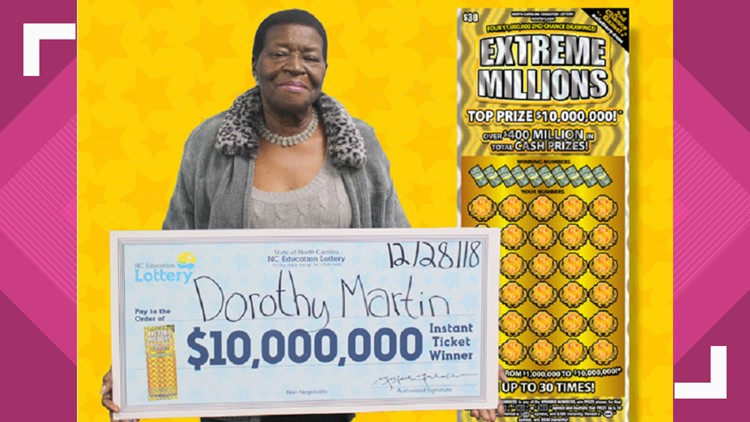 That's because Dorothy Martin, of Grover, won $10 million playing the 'Extreme Millions' scratch-off game. Martin told lotter officials she didn’t expect any excitement on Christmas Eve, but said that all changed when she saw that her ticket was a winner. Martin purchased ther ticket at the Three Handy Mart on Blacksburg Road in Grover. According to Wikipedia, the town of Grover is located in Cleveland County and has a population of just over 700 people. Its' a sure bet everybody knows everybody, and Martin is the probably talk of the town. Martin said after buying the ticket she went to her car and started scratching. She then went back inside and asked the clerk double check the ticket, she said. “I told her, ‘If this is real, you better call the paramedics now. I’m sure I’ll have a heart attack,’” Martin said. It was real and Martin claimed her prize Friday at lottery headquarters in Raleigh. She chose the lump sum and took home $4,230,069 after required state and federal tax withholdings,. She plans to use some of the money to get a new home. She also plans to help her grandchildren and great-grandchildren. RELATED: Winston-Salem Man Thankful For $530K Plus Winning Lotto Ticket!